When we moved into our current apartment in October, all our gift wrapping supplies ended up buried in the back of some closet. Some of it got destroyed shoved in that little closet. A couple of times I refused to dig the supplies out because it was a pain, which meant I spent more money on supplies I didn’t need. 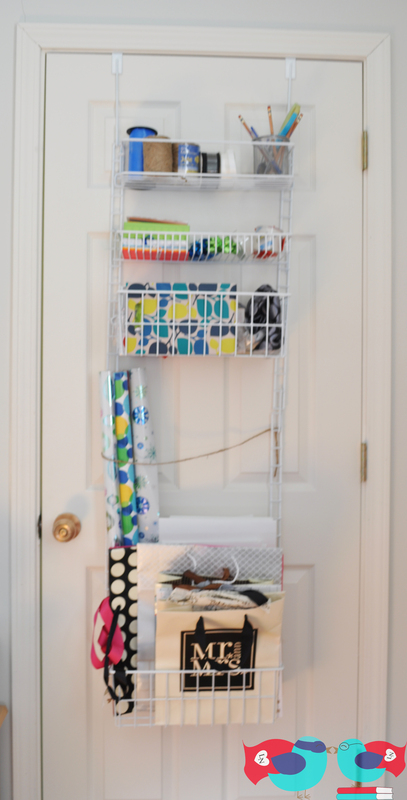 I saw so many cute wrapping station ideas, but most of them required a home or at least a larger space. 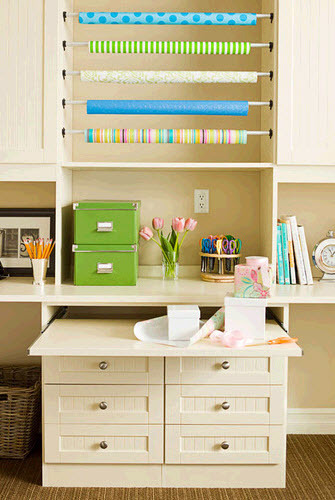 For example, this gorgeous wrapping station featured on California Closets. Then, I found this station on Better Homes and Gardens. 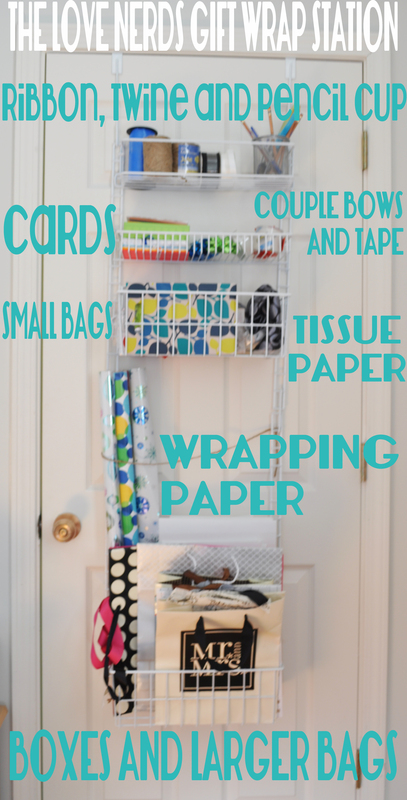 It was perfect to put on the back of our closet door, especially since all the supplies would be neatly tucked into a nook with our office door staying open most of the time. The problem is that there is no logistical information on the site; I wanted to know where I could buy the shelving. Here is what I was able to come up with! It still isn’t as cute as the one in the picture, I need some more ribbon and cute little jars, but it is really functional for me. First of all, I bought the shelving on Chefs. It is a 6-shelf adjustable pantry door rack and costs $35. Chefs offers free shipping on any order over $25, so that wasn’t an added cost for the project. The shelves are a variety of shapes, including the larger basket on the bottom. Because the wrapping paper is so tall, I could only use 4 shelves. My top shelf: The top shelf currently holds ribbon and twine plus a cup holder where I always keep a couple pencils, pens, and a pair of scissors. My second shelf: Here I keep a couple boxes of generic cards: some thank you cards, plain birthday cards, and some pretty blank cards. These are great to have on hand because it makes it more manageable to write a quick card. I can be so lazy; if I need to search for a thank you card, it probably won’t be written. I also have stamps and some tape (both scotch tape and package tape just in case I am mailing a gift off). My third shelf: This shelf is a deeper and taller, so it is a good place for me to keep smaller bags and all my tissue paper. At the bottom: My wrapping paper rolls are resting inside the bottom basket. If you look closely though, you will see that I have tied a piece of twine across the shelving unit to make sure that the rolls stay back toward the door. This basket also houses all my shirt and gift boxes as well as all the larger bags. Again, it is far from perfect but it has been a great solution for a small space. 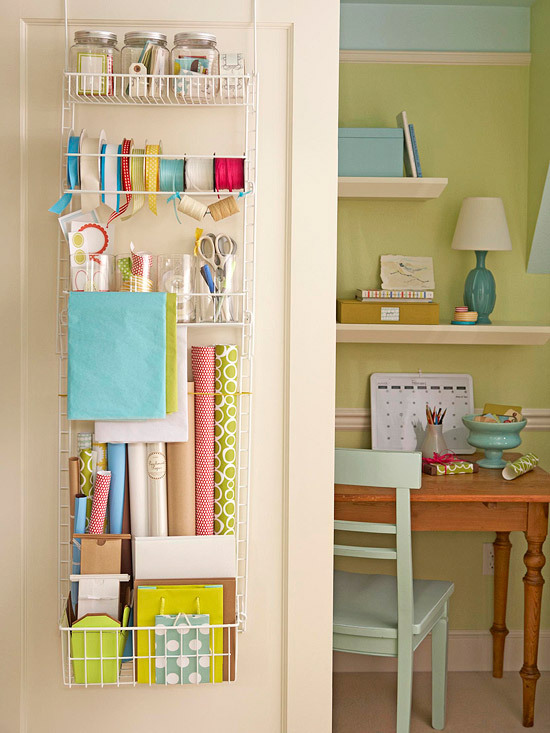 I hope that maybe this gives a couple of you tangible ideas for how you can have your own wrapping station tucked away in a small spot of your home. I would love to see other ideas from all of you about how you organized all your wrapping supplies, especially in apartment settings! If you want to see some of my other organizations Pinspirations, including other wrapping stations, heads over to my Home: Organization board and start following! The wrapping station has been featured on Making the World Cuter: 10 Inspirational Organization Ideas! All I can is wow and I wish I had that in my apartment, it is beautiful and well arranged. Thank you for sharing this one, I’m inspired. Thanks as always, Danielle, for stopping by! I am pretty proud of this project. It is not always easy coming up with feasible solutions in a small space. Super clever! Thank you for linking up at Show-licious Craft Showcase! Thanks, Marti! I love your party and wouldn’t miss it. Thanks, Kayla! I hope that this idea works for you as well. I had linked up my Washi Tape Tea Lights to the DIY’ers, but I just added this wrapping station as well. Thanks for the support! I love your site and definitely link up every week. Thanks for sharing, I’m pinning this idea! We recently had to move for my husband’s job and went from a house to an apartment, so I am always looking for creative ideas for organization. Our wrapping paper and supplies usually get stuffed in the back of a closet or under the bed and get bent and messed up. I love this solution! We have moved five times in the past year, so I have had to spend a lot of time negotiating new spaces. I hope this solution will work for you. It was a quick project and has definitely saved me some money in the long run because I am not always buying new materials – I definitely had supplies stuffed in places before like you do now.